Dog owners are always looking for healthy, and great tasting dog treats to provide for their favorite four-legged family members. In addition to dog biscuits or snacks, which are an ideal training treat, chew bones are another important option in a special treat for your dog. Dog chew bones are designed to last longer and provide the chewing action that all dogs crave. 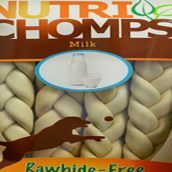 These treats come in a variety of sizes and shapes, and they are designed as a once a day treat for your dog for a job well done or just for being such a great companion and friend. There are typically several different flavors and options in these treats. The chicken dog treats are often the most popular both for humans as well as for the dogs. With different options on the market, there are a few important factors to consider. Many of the bagged and pouched types of chicken dog treats are soft. These soft treats may taste great to your dog, but they do not offer the dental health benefits of the crunchy, chewy treats. When choosing any type of chicken chew bone, make sure there is no rawhide in the bone. This should be clearly indicated on the packaging. As with any type of treat or chew bone flavor, it is critical to ensure the dog has the right size. Chew bones that are too small can be easily broken into small parts by the dog and swallowed, posing a choking hazard. Very small chew bones can be swallowed whole, which is also a significant risk. Always verify the chicken dog treats selected are made from real ingredients. This means no meat flavorings, by-products or meals are used as the top ingredients in the chew. Instead, look for real chicken, pork skin, milk, and peanut butter along with the vitamins and minerals your dog needs for optimal health.